This article is about the American legislator. For the fictional district attorney, see Adam Schiff (Law & Order). Schiff is an influential voice for the Democratic Party on foreign policy and national security issues in the House of Representatives. He currently serves as the chairman of the United States House Permanent Select Committee on Intelligence. He is currently on leave from the House Appropriations Committee which he joined in 2007. He previously served on the United States House Foreign Affairs Committee and serves on the State, Foreign Operations and Related Programs Subcommittee of the Appropriations Committee. 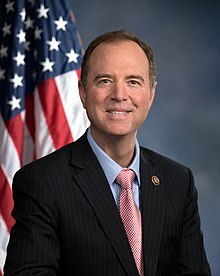 Schiff was born in Framingham, Massachusetts, the son of Edward and Sherrill Ann (Glovsky) Schiff. He was raised in a Jewish family, and moved to Danville, California, during high school. He graduated from Monte Vista High School and received a political science degree from Stanford University and a J.D. degree from Harvard Law School. 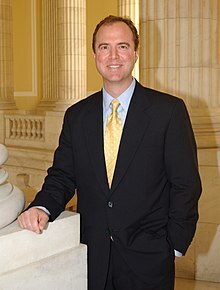 After Harvard Law School, Schiff began working as a prosecutor in the Los Angeles branch of the U.S. Attorney's Office. While an assistant U.S. Attorney, he gained attention by prosecuting a case against Richard Miller, a former FBI agent convicted of "passing secret documents to the Soviet Union in exchange for a promised $65,000 in gold and cash." The first time Miller was tried, it resulted in a hung jury; the second time, it resulted in a conviction overturned on appeal, and the third time he was convicted. Schiff was elected to the California State Senate in 1996, after two unsuccessful bids for state assembly. He chaired that body's judiciary committee during his one term. Although Schiff was elected to California's 21st State Senate district, the area the district currently represents has changed through redistricting, and the area Schiff originally represented is now roughly considered the 25th Senate district. During his tenure in the state senate, Schiff authored Senate Bill 1847, Chapter 1021. Signed into law in 1998, this created the Pasadena Blue Line Authority, which continued work on the stalled then-Blue Line light rail extension to Pasadena, which would later be named the Gold Line instead. Schiff began serving his 10th term in Congress in January 2019. Schiff voted in favor of the 2003 invasion of Iraq. In February 2015, discussing how or whether to tailor Bush-era plans from 2001 and 2002 to fight ISIS, Schiff was asked if he regretted voting to invade. He said, "Absolutely. Unfortunately, our intelligence was dead wrong on that, on Saddam at that time. The vote set in motion a cascading series of events which have [had] disastrous consequences." Schiff has been a leading voice in Armenian-American issues; he claims to have over 70,000 Armenian-Americans in his district. He introduced U.S. House Resolution 106, recognizing the Armenian genocide, which was approved by the House Foreign Affairs Committee on October 11, 2007 but began to lose support after Turkey's prime minister said that approval of the resolution would endanger U.S.-Turkey relations. On March 4, 2010 the resolution was again approved to go forward by the House Foreign Affairs Committee by a 23-22 margin. Immediately, the Turkish government recalled its U.S. ambassador. Schiff said in 2007, "When you think about what we have against us -- the president, a foreign policy establishment that has condoned this campaign of denial, the Turkish lobby -- against that you have the truth, which is a powerful thing but doesn't always win out." He continues to reintroduce the resolution each subsequent Congress. Beginning with Rep. Howard Berman before Berman was defeated for reelection, Schiff has worked on reducing unwanted helicopter noise across Los Angeles County by proposing legislation to force the FAA to study and regulate helicopter noise in Los Angeles, the Helicopter Noise Relief Act. After reintroducing his legislation, Schiff worked with Senator Dianne Feinstein to push the FAA to act, and together they attached a provision in the 2014 omnibus appropriations package directing the Secretary of the Department of Transportation and FAA to address helicopter noise in Los Angeles County skies. As a result, in 2015 the FAA created a county-wide helicopter noise public complaint system, the first step towards regulation. Schiff has been a prominent supporter of surveillance reforms, especially in the wake of the leaks of classified intelligence by Edward Snowden. In 2007, in response to disclosure of the Terrorist Surveillance Program, Schiff and Rep. Jeff Flake offered a successful amendment in the House of Representatives to clarify that the Foreign Intelligence Surveillance Act is the exclusive means for collecting foreign intelligence information within the United States. Schiff has been a critic of the bulk collection of telephone metadata by the National Security Agency. In January 2014, Schiff introduced the Telephone Metadata Reform Act, which would prohibit the bulk collection of domestic phone records. Schiff has also introduced several bills aimed at reforming the Foreign Intelligence Surveillance Court, including a bill to require outside counsel to be appointed to argue for privacy and civil liberties protections in certain cases before the Court. Schiff was appointed to the House Select Committee on Benghazi in 2014 by Nancy Pelosi to serve as one of the five Democrats on the Committee. Schiff had participated in the House Permanent Select Committee on Intelligence investigation into the attacks on the Benghazi diplomatic compound, which found that the initial talking points provided by the intelligence community were flawed but without an intention to deceive, and that diplomatic facilities across the world lacked adequate security. The report's findings were unanimous and bipartisan. Before he was appointed as a Member of the Benghazi Select Committee, Schiff called the establishment of a select committee to investigate the 2012 attack a "colossal waste of time," and said Democratic leaders should not appoint any members, stating: "I think it's just a tremendous red herring and a waste of taxpayer resources." Despite those reservations, he still accepted an appointment to the Committee because if he felt he "could add value, [he] would serve." Schiff formed the bipartisan, bicameral Congressional Caucus for the Freedom of the Press in 2006 aimed at advancing press freedom around the world. The Caucus proposed the Daniel Pearl Freedom of the Press Act and it was originally introduced to Congress by Schiff and Rep. Mike Pence (R., Ind.) and by Sen. Christopher Dodd (D., Conn.) on October 1, 2009 in response to the murder of Daniel Pearl by terrorists in Pakistan. The legislation requires the United States Department of State to expand its scrutiny of news media intimidation and freedom of the press restrictions during its annual report on human rights in each country. After its introduction, the act passed through the House of Representatives with a vote of 403 to 12 and passed unanimously in the Senate; however, a provision requiring the Secretary of State (in coordination with the Department of State's Bureau of Democracy, Human Rights and Labor, and in consultation with the Undersecretary for Public Affairs and Public Diplomacy) to establish a grant program aiming to promote freedom of the press worldwide was removed in the Senate. On May 17, 2010 President Barack Obama, accompanied by the Pearl family, signed into law the Daniel Pearl Freedom of the Press Act. In 2015, Schiff supported the Saudi Arabian-led intervention in Yemen, saying: "The military action by Saudi Arabia and its partners was necessitated by the illegal action of the Houthi rebels and their Iranian backers. ... But ultimately, a negotiated end to this crisis is the only way to restore order in Yemen and shrink the space for terrorism." After the President's speech at the National Defense University examining the U.S. war powers during the War on Terror, Schiff introduced bipartisan legislation to repeal the 2001 Authorization for Use of Military Force Against Terrorists, the legislation passed in the days after the September 11 attacks to combat Al Qaeda, because he felt that "the current AUMF is outdated and straining at the edges to justify the use of force outside the war theater." The bill, introduced with Rep. Tom Rooney (R-FL), was intended to sunset. In addition to his legislation, Schiff has been a forceful proponent of debating and voting on a new war authorization against ISIS. Schiff has been a very prominent supporter of national defense spending. Schiff has voted for every increase in the defense budget over the course of his career. On March 22, 2017, in a interview with Chuck Todd on MSNBC Schiff claimed there was “more than circumstantial evidence now” that Donald Trump's campaign colluded with Russia. Todd followed up by asking if he had seen direct evidence of collusion and Schiff responded that there was "evidence that is not circumstantial and is very much worthy of investigation." On April 2, 2017 Schiff, the ranking member on the House Select Intelligence Committee, which is tasked with conducting inquiries related to Russian interference in the 2016 United States elections, appeared on CNN's State of the Union. In the wide-ranging interview, Schiff and host Jake Tapper discussed Michael Flynn's request for immunity, Schiff's and Devin Nunes's separate inspections of White House documents, Trump's allegations of wiretapping in Trump Tower, and Nunes's apparent close association with the Trump White House. Tapper asked Schiff if there was evidence of Donald Trump–Russia collusion. Schiff replied: "I don't think we can say anything definitively at this point. We are still at the very early stage of the investigation. The only thing I can say is that it would be irresponsible for us not to get to the bottom of this." Tapper asked, "Do you think that Chairman Nunes was part of an attempt to provide some sort of cover for the president's claim about Obama wiretapping him at Trump Tower, which, obviously, this does not prove, but to cover for that, or an attempt to distract, as you're suggesting?" Schiff replied, "It certainly is an attempt to distract and to hide the origin of the materials, to hide the White House hand. The question is, of course, why? And I think the answer to the question is this effort to point the Congress in other directions, basically say, don't look at me, don't look at Russia, there is nothing to see here." A few days later, Nunes recused himself as leader of the investigative panel while the House Committee on Ethics investigated whether he had disclosed classified information. On July 23, 2017, on "Meet the Press", Schiff stated, "[A]t the end of the day we need to make sure that our president is operating not in his personal best interests and not because he's worried about what the Russians might have but because what he is doing is in America's best interest. The fact that we have questions about this is in itself harmful." The following morning on Twitter, Trump referred to Schiff as "Sleazy Adam Schiff, the totally biased Congressman looking into 'Russia'" and called the Russian collusion investigation "the Dem loss excuse". Schiff responded on Twitter that the president's "comments and actions are beneath the dignity of the office." In December 2018 Schiff suggested that Trump associate Roger Stone may have lied to Congress, and said the transcript of his testimony should be forwarded to the Special Counsel. Stone hit back, saying Schiff was "a con man" and "full of Schiff". When he became Chair of the House Intelligence Committee in 2019, Schiff took a personal mission to investigate Trump's connections to Russia, separate from the investigation by the Special Counsel. Schiff came under fire when he demurred when asked if he would accept it if the Special Counsel's investigation concluded that Donald Trump did not collude with Russia, saying that he has great confidence in Mueller but that "there may be, for example, evidence of collusion or conspiracy that is clear and convincing, but not proof beyond a reasonable doubt," as is needed for a criminal conviction. On March 28, 2019, the nine Republican members of the House Intelligence Committee officially called for Schiff to resign due to his allegations that President Trump’s campaign colluded with Russians in the 2016 election. Schiff responded by accusing the Republican members of tolerating "immoral" and "corrupt" conduct by Trump campaign members and administration appointees. Schiff called North Korea "one of the most brutal and despotic regimes in the world." After the death of American student Otto Warmbier who had been imprisoned during a visit to North Korea, Schiff said: "The barbaric treatment of Otto Warmbier by the North Korean regime amounts to the murder of a U.S. citizen." In April 2018, asked whether he thought Trump deserved at least partial credit for North Korea's involvement in talks with the US, Schiff responded: “I think it's more than fair to say that the combination of the president's unpredictability and indeed, his bellicosity had something to do with the North Koreans deciding to come to the negotiating table. After news reports that the CIA concluded that Saudi Crown Prince Mohammed bin Salman had ordered the assassination of Saudi journalist Jamal Khashoggi, Trump said there was insufficient CIA evidence to link bin Salman to the murder. Schiff, the top Democrat on the House intelligence committee, was briefed by the CIA on the agency assessment, and stated afterwards that Trump was being dishonest about the CIA findings. Schiff has become a popular fixture on cable news networks. In February 2018, The Washington Times reported an RNC analysis on Schiff's media appearances, revealing that Schiff had made 227 television appearances from January 2017 to February 2018, totaling over 26 hours of airtime. Schiff logged 111 MSNBC appearances and 87 CNN appearances. In 2017, Schiff spoke on the House floor ten times for about 36 minutes total. CNN stated of Schiff: "Schiff has been described as becoming an ‘overnight celebrity’ in Democrat circles in the past year." In 2000, Schiff challenged Republican incumbent Jim Rogan in what was then the 27th District. The district had once been a Republican stronghold, but had been trending Democratic since the early 1990s. In what was the most expensive House race ever at the time (several elections in 2006 and 2008 later eclipsed it), Schiff unseated Rogan, taking 53 percent of the vote to Rogan's 44 percent. He became only the second Democrat to represent this district since its creation in 1913. After the 2000 census, the district was renumbered as the 29th and made significantly more Democratic. As a result, Schiff has never faced another contest nearly as close as his 2000 bid, and has been reelected eight times. His district became even more Democratic after the 2010 census, when it was renumbered as the 28th and pushed into Los Angeles itself. In 2010, Schiff defeated Tea Party–backed Republican John Colbert for a sixth term. In 2012, he defeated Republican Phil Jennerjahn. In 2014, he defeated independent candidate Steve Stokes. In 2016, he defeated Republican candidate Lenore Solis. In 2018, he competed in the primary with Democratic challenger Kim Gruenenfelder. After Gruenenfelder dropped out of the race, he became the Democratic candidate and defeated Republican candidate Johnny Nalbandian. Schiff and his wife Eve have two children, Alexa and Elijah. Schiff has participated in multiple endurance challenges, including triathlons and marathons. Schiff was the only Congressman to participate in the inaugural Washington, D.C. triathlon in 2010 and has since participated in other races in Philadelphia, New York City, and Malibu. In 2014, Schiff was the first member of Congress to participate in the AIDS/LifeCycle, a seven-day charity bike ride from San Francisco to Los Angeles to raise awareness and funding to fight HIV and AIDS. Schiff is vegan. ^ Neuman, Johanna (June 5, 2005). "Congressman Is Gaining a Name in Foreign Affairs". Los Angeles Times. Retrieved August 22, 2014. ^ Stone, Kurt F. (2011). The Jews of Capitol Hill: A Compendium of Jewish Congressional Members. Lanham, MD: Scarecrow Press. ISBN 9780810857315. p. 564. ^ Peschiutta, Claudia (July 22, 2000). "Meet Adam Schiff". Glendale News-Press. Retrieved August 22, 2014. ^ Soble, Ronald (October 10, 1990). "Ex-FBI Agent Miller Guilty of Espionage". Los Angeles Times. Retrieved August 22, 2014. ^ Fleeman, Michael (August 22, 1990). "THIRD ESPIONAGE TRIAL BEGINS FOR FORMER FBI AGENT". Associated Press. Retrieved August 22, 2014. ^ Weinstein, Henry (December 8, 1989). "Gave Soviets Nothing, Miller Says : Espionage: The former FBI agent says his relationship with a Russian woman spy was 'the dumbest thing I did in my whole life.'". Los Angeles Times. ^ Mills, James (August 30, 2012). "Adam Schiff Enjoying Getting to Know West Hollywood". Patch-AOL. Retrieved August 22, 2014. ^ Halper, Evan; Simon, Richard (June 11, 2011). "District maps draw a new political landscape". LA Times. Retrieved July 20, 2018. ^ "Legislative District Maps". JoinCalifornia. Retrieved July 20, 2018. ^ "Roll Call Vote in House on Iraq Resolution". The New York Times. October 10, 2002. ^ U.S. Deputy: We do not want a second invasion of Iraq and Arabs must end their wars themselves. SHAFAQ. February 13, 2015. ^ "Obama Asks Congress for War Powers; Interview with Representative Adam Schiff". CNN. February 11, 2015. Retrieved October 5, 2017. ^ "U.S. House Speaker: Armenian Genocide Measure Will Go Forward". Archived from the original on October 13, 2007. Retrieved October 11, 2007. ^ "Turkey's PM says U.S. relations in danger". Reuters. October 12, 2007. Archived from the original on October 13, 2007. Retrieved October 12, 2007. ^ a b Simon, Richard; Watanabe, Teresa (March 5, 2010). "House panel narrowly passes recognition of Armenian genocide". Los Angeles Times. Archived from the original on March 7, 2010. Retrieved March 4, 2010. ^ Simon, Richard (October 17, 2007). "Genocide resolution's support starts to fade". L.A. Times. Retrieved October 5, 2017. ^ Aguilar, Erika (December 7, 2012). "Congressman Schiff says he will reintroduce helicopter noise bill". Southern California Public Radio. Retrieved December 9, 2014. ^ Simon, Richard (January 14, 2014). "Spending bill to likely give L.A. $130 million for key rail projects". Los Angeles Times. Retrieved December 9, 2014. ^ "FAA To Create Public Complaint System For Helicopter Noise". CBS Los Angeles. Retrieved December 9, 2014. ^ Weikel, Dan (April 1, 2015). "Complaint system for helicopter noise begins operations countywide". L.A. Times. Retrieved October 5, 2017. ^ Holman, Kwame (July 2, 2013). "Crusader for More Transparency on Intelligence Sees Risk and Reward From Snowden Leaks". PBS. Retrieved December 9, 2014. ^ Anderson, Nate. "House reaffirms FISA as "exclusive means by which electronic surveillance may be conducted"". Ars Technica. Retrieved December 7, 2014. ^ Shabad, Rebecca (January 14, 2014). "Schiff unveils NSA metadata reform bill". The Hill. Retrieved December 7, 2014. ^ Sledge, Matt. "Adam Schiff Prepares FISA Court Bill To Create Special Privacy Advocate". The Huffington Post. ^ Weisman, Jonathan (May 22, 2014). "Pelosi Picks 5 Democrats for Panel on Benghazi". New York Times. Retrieved August 23, 2014. ^ Walsh, Dierdre (August 6, 2014). "Benghazi probe presses ahead despite new report". Retrieved August 23, 2014. ^ Hicks, Josh (May 4, 2014). "Schiff: Benghazi select committee a 'colossal waste of time'". The Washington Post. Retrieved May 10, 2014. ^ Mikailian, Arin (May 24, 2014). "House appoints Schiff to Benghazi investigation committee". Burbank Leader. Retrieved August 23, 2014. ^ "The Congressional Caucus for Freedom of the Press Calls on Secretary of State Rice to Urge Russia to Protect Journalist Rights". Schiff Congressional Website. Archived from the original on December 7, 2014. Retrieved December 9, 2014. ^ "President Obama Signs the Daniel Pearl Freedom of the Press Act". The Cypress Times. Retrieved December 1, 2010. ^ a b Meckler, Laura (May 17, 2010). "Obama Signs Pearl Press-Freedom Act". The Wall Street Journal. Retrieved December 1, 2010. ^ "U.S. to Promote Press Freedom". The New York Times. New York, NY. ^ Liberman, Rachel (May 18, 2010). "The Daniel Pearl Freedom of the Press Act: A positive step in an ambiguous direction". Sociology Lens. sociology.net. Retrieved June 2, 2017. ^ Meckler, Laura (May 17, 2010). "Obama Signs Daniel Pearl Press Freedom Act". Wall Street Journal. Retrieved December 9, 2014. ^ Ackerman, Spencer. "Congressman Preps Bill to End Terror War Authority". Wired. Retrieved December 9, 2014. ^ Schiff, Adam (November 17, 2014). "Congress must exercise its war powers". Los Angeles Times. Retrieved December 9, 2014. ^ Conway, Madeline (March 22, 2017). "Schiff: There is now 'more than circumstantial evidence' of Trump-Russia collusion". Politico. Retrieved April 2, 2019. ^ Parker, Ashley (April 2, 2017). "Top Democrat accuses White House of trying to distract from Russia probe". Chicago Tribune. Retrieved October 5, 2017. ^ "Schiff: Still no 'definitive' link between Russia, Trump campaign". Fox News. April 2, 2017. ^ "Interview With California Congressman Adam Schiff". CNN. April 2, 2017. Retrieved October 5, 2017. ^ Berman, Russell (April 6, 2017). "The Swift Fall of Devin Nunes". The Atlantic. Retrieved October 5, 2017. ^ Huetteman, Emmarie (April 6, 2017). "Devin Nunes to Step Aside From House Investigation on Russia". The New York Times. Retrieved October 5, 2017. ^ "Transcript: Rep. Adam Schiff on "Face the Nation," July 23, 2017". Retrieved July 24, 2017. ^ Wire, Sarah D. (July 24, 2017). "California's Rep. Adam Schiff gets a Trump nickname: 'Sleazy'". L.A. Times. Retrieved October 5, 2017. ^ @RepAdamSchiff (July 24, 2017). "With respect Mr. President, the problem is how often you watch TV" (Tweet). Retrieved October 5, 2017 – via Twitter. ^ Balsamo, Michael (December 2, 2018). "Rep. Schiff suggests Roger Stone may have lied to Congress". AP News. Retrieved February 21, 2019. ^ Giaritelli, Anna (December 6, 2018). "Roger Stone hits back at Adam Schiff: He's 'full of Schiff'". Washington Examiner. Retrieved February 21, 2019. ^ "Democratic Rep. Adam Schiff hesitates when asked if he'll accept Robert Mueller's findings". The Week. February 17, 2019. Retrieved February 21, 2019. ^ "Rep. Adam Schiff, Republicans clash at Intelligence Committee hearing". Los Angeles Times. March 28, 2019. Retrieved March 29, 2019. Republicans on the House Intelligence Committee demanded that Chairman Adam Schiff step down over his allegations that President Trump’s campaign colluded with Russians in the 2016 election. ^ Santiago, Sharon (March 29, 2019). "I Don't Think It's Ok". Feminine Perspective Magazine. The RINJ Foundation. Retrieved March 30, 2019. I don’t think it’s OK. I think it’s immoral, I think it’s unethical, I think it’s unpatriotic and, yes, I think it’s corrupt, and evidence of collusion. ^ Fandos, Nicholas (March 28, 2019). "Demands for Adam Schiff's Head Highlight Chasm That Only Widened With Mueller's Conclusion". The New York Times. Retrieved March 29, 2019. ^ "After Otto Warmbier's death, top senators say U.S. should consider banning North Korea travel". USA Today. June 20, 2017. ^ "Trump's 'Unpredictability' Helped North Korea Peace Talks, Adam Schiff Says". Newsweek. April 29, 2018. ^ Shane Harris; Greg Miller; Josh Dawsey (November 16, 2018). "CIA concludes Saudi crown prince ordered Jamal Khashoggi's assassination". The Washington Post. ^ "Top Democrats accuse Trump of lying about CIA's Jamal Khashoggi report". The Guardian. ^ Harper, Jennifer. "The Adam Schiff Strategy: the power of 227 TV appearances". ^ "Members". Congressional LGBT Equality Caucus. Retrieved August 31, 2016. ^ "Members". New Democrat Coalition. Retrieved February 6, 2018. ^ "Membership". Congressional Arts Caucus. Archived from the original on June 12, 2018. Retrieved March 13, 2018. ^ Center for Responsive Politics. "Most Expensive Races 2000". Retrieved April 9, 2012. ^ Center for Responsive Politics. "Most Expensive Races 2006". Retrieved April 9, 2012. ^ Center for Responsive Politics. "Most Expensive Races 2008". Retrieved April 9, 2012. ^ Kellam, Mark. "Schiff, Gatto easily win their political races". Glendale News-Press. Retrieved November 21, 2014. ^ "About Adam Schiff for Congress". AdamSchiff.com. Retrieved May 27, 2018. ^ Wilkie, Christina (June 21, 2010). "Schiff completes inaugural D.C. Triathlon". Retrieved August 22, 2014. ^ Rojas, Warren (May 30, 2014). "Adam Schiff Mounts Most Grueling Endurance Challenge Yet". Roll Call. Retrieved August 22, 2014. ^ St. John, Stevie (May 31, 2014). "Rep. Schiff Pedaling from SF to LA with HIV/AIDS Ride". WEHOville. Retrieved August 22, 2014.